Living in a desert, water is life’s blood. We need to conserve as much as possible. Earlier this year, Mayor Nexsen took the Wyland Foundation’s Water Pledge. He promised our City would take the steps necessary to be more water wise. More than 4800 cities participated nationwide. We placed eighth in our class. Don’t make this a “one-off”. 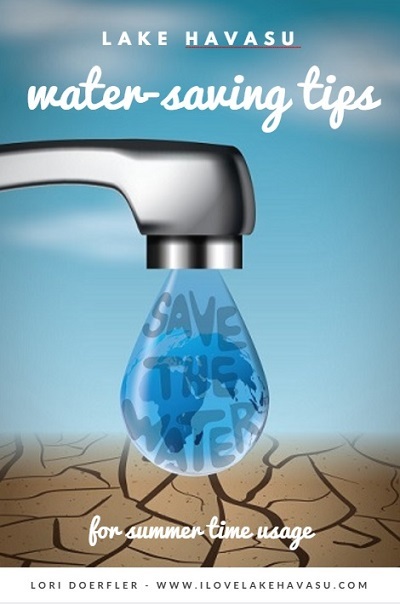 Water conservation needs to be a lifestyle. Follow these Lake Havasu water-saving tips for lowering summer usage. We still have several weeks of warm temperatures to put these tips to good use. Cold drinking water – A cold glass of water on a hot day sounds like heaven. However, anyone who’s ever turned on a faucet inside their Lake Havasu home during the summer knows that it takes a while for the water to cool off. Keep a full pitcher of drinking water inside your refrigerator. It’s ready any time you want it and it will be much colder than anything you’d get out of the tap. Swamp coolers – Do you have a swamp cooler in your Lake Havasu home? Did you know it won’t work properly in high humidity? Even with our “dry heat”, Lake Havasu experiences some humidity. Visit the City’s weather page to find the daily dewpoint. If it goes above 40F, your swamp cooler becomes less efficient. It might be better to close the blinds and utilize ceiling fans or oscillating floor fans instead. Irrigation – Check your home’s irrigation system for any leaks or breaks. Then, repair/replace as soon as possible. In the summer, trees, shrubs and ground cover only need watering once every one to three weeks. Cactus and succulents can go two weeks to 30 days between watering. If you’re on an automatic sprinkler system (and I highly suggest you should be), set it to go off after the sun goes down. Moisture stays in the ground longer during the cooler parts of the day. Also, add an auto-close nozzle to the end of your hose to automatically stop water when not in use. Swimming pool – Many Lake Havasu homes include a swimming pool. During the summer time, keep the water circulating longer. First, this helps chemicals mix together better to keep your pool sparkling clean. Next, it reduces evaporation. Finally, circulating water actually stays cooler than stagnant water. Cleaning walkways and driveways – Forget the hose. A little elbow grease goes a long way. Use a broom to clear off dirt from these areas. Rain barrels – Rain barrels? In the desert? Yes. Sometimes, it rains even in a desert climate like Lake Havasu City. During monsoon season (June through September), place rain barrels below the lowest parts of your home’s roof. Keep them covered to lessen evaporation. Then, utilize this water to sprinkle on your plants and shrubs. What Lake Havasu water-saving tips do you use in the summer time? I’d love to hear any ideas you have used that work. Please let me know in the comments below.